New made German M1924 stick grenade. These reproductions are made in Eastern Europe from 100% wood and paint. They look amazing and are the correct size and shape. These came bulk packed so expect small marks from shipping/storage. 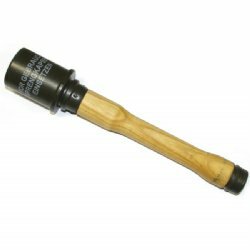 German stick grenades could be thrown three times further than allied grenades. A great historical addition to your WWII collection. Product Review: My kids LOVE it! Must have for kids playing army in the backyard. Also is a pretty neat piece to keep on display. Product Review: The M24 is very well made and detailed. A great conversation item. For the collector it is well worth having and the price is very good. Product Review: Product is very well made. Lots of details in it that could easily be mistaken for metal parts, tut is actually all wood. Had more fun waving this around than with the gun parts I had In the same package. 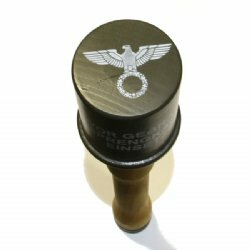 Fun gift for people who enjoy militaria and just neat decorations. Hard to believe how little it costs for the product you get.